Measures the similarity between the set of non-zero pixels of two images. where and are respectively the set of non-zero pixels in the first and second input images. Operator represents the size of a set and represents the intersection of two sets. This filter requires the largest possible region of the first image and the same corresponding region in the second image. It behaves as filter with two input and one output. Thus it can be inserted in a pipeline with other filters. The filter passes the first input through unmodified. This filter is templated over the two input image type. It assume both image have the same number of dimensions. Definition at line 58 of file itkSimilarityIndexImageFilter.h. Reimplemented from itk::ImageToImageFilter< TInputImage1, TInputImage1 >. Definition at line 66 of file itkSimilarityIndexImageFilter.h. Definition at line 84 of file itkSimilarityIndexImageFilter.h. Definition at line 79 of file itkSimilarityIndexImageFilter.h. Definition at line 86 of file itkSimilarityIndexImageFilter.h. Definition at line 77 of file itkSimilarityIndexImageFilter.h. Definition at line 72 of file itkSimilarityIndexImageFilter.h. Definition at line 80 of file itkSimilarityIndexImageFilter.h. Definition at line 87 of file itkSimilarityIndexImageFilter.h. Definition at line 78 of file itkSimilarityIndexImageFilter.h. Definition at line 76 of file itkSimilarityIndexImageFilter.h. 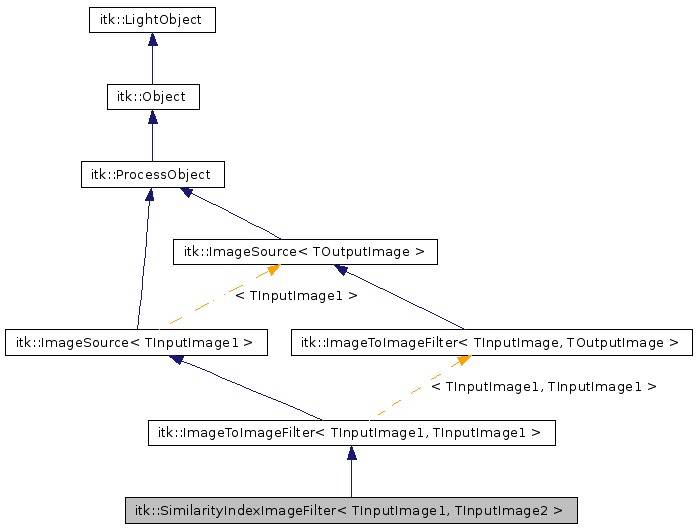 Reimplemented from itk::ImageSource< TInputImage1 >. Definition at line 65 of file itkSimilarityIndexImageFilter.h. Type to use form computations. Definition at line 94 of file itkSimilarityIndexImageFilter.h. Definition at line 82 of file itkSimilarityIndexImageFilter.h. Definition at line 63 of file itkSimilarityIndexImageFilter.h. Definition at line 83 of file itkSimilarityIndexImageFilter.h. Definition at line 64 of file itkSimilarityIndexImageFilter.h. Definition at line 125 of file itkSimilarityIndexImageFilter.h. Initialize some accumulators before the threads run. Reimplemented in itk::ContourMeanDistanceImageFilter< TInputImage1, TInputImage2 >, and itk::HausdorffDistanceImageFilter< TInputImage1, TInputImage2 >. Definition at line 104 of file itkSimilarityIndexImageFilter.h. Return the computed similarity index. Definition at line 97 of file itkSimilarityIndexImageFilter.h.